The 1550 nm Forward Transmitter - Externally Modulated (FT5X) is designed to plug into PBN's latest Advanced Intelligent Multi-services Access platform (AIMA3000). 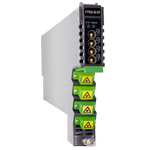 PBN's wavelength-tunable FT5X series is available in dual and quad transmitter variants. 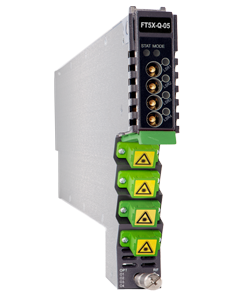 This series of modules includes Monolithic Distributed Bragg Reflector (DBR) laser with a Silicon Optical Amplifier and an Indium- Phosphide (InP) Mach- Zehnder Modulator provide AIMA with a cost-effective system for 1550 nm transmissions for DWDM applications when used for optical ITU frequency grids. PBN's AIMA3000 FT5X series transmitter is designed for multi-services operators (MSOs) to increase network capacity to satisfy an ever-growing subscriber demand for more bandwidth. The FT5X can be used with Erbium Doped Fiber Amplifiers (EDFA) in short haul Fiber-to-the-Home (FTTH) applications and medium haul setups with a high RF performance of up to 60 km. 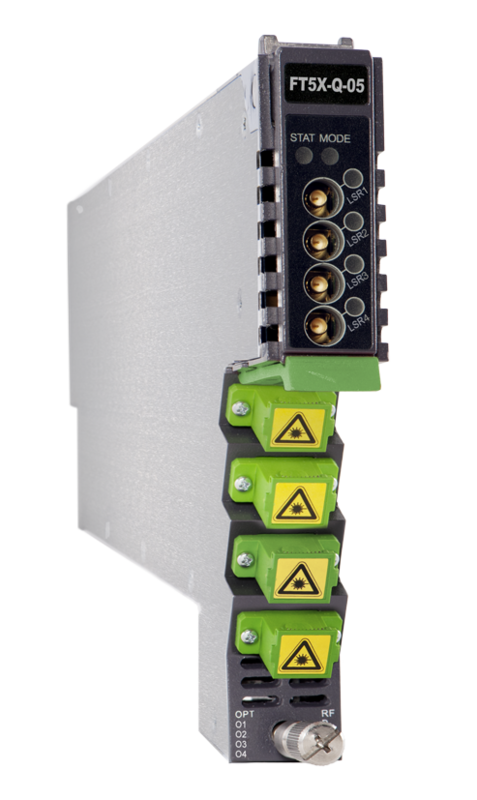 All FT5X models can also be conveniently monitored and controlled through a computer connected to one of the Ethernet ports via the ASMM module. All module settings are retained in non-volatile memory to ensure trouble-free operation. Bulk updating, automatic uploading and downloading of configuration files can be done when using PBN's NMSE web- based management system. (1) Tunable version. The factory default ITU optical channel is 33 and the ITU optical channel can be changed via the Web GUI . (2) Standard option. Contact a PBN Sales Representative for availability of other options. (4) Two/Four mini-SMB connectors on front panel to measure the RF input before the laser transmitter. (5) MER and BER are tested with 117 QAM256 (301.25 MHz ~ 997.25 MHz). All are measured with PBN referenced optical receiver with 20 km single-mode optical fiber 0 dBm. (1) Default spacing is 200 GHz. For other wavelength configurations not listed, please contact PBN. Quad version, X1 is first channel and X2 is the fourth channel. The second is 200 GHz higher than the first. The third channel is 200 GHz higher from the second. (3) When order tunable lasers, write T in X1X2 option. T will apply to all ports (2 or 4).